Jordan Abraham was the first place winner of the ams division at the 1st Annual Girls Combi Pool Classic exactly one year ago. Jordan blazed the bowl to come out on top about the field of amateurs: she flow the bowl with frontside and backside air, air to fakies, axle stalleds, and backside frontside grinds that ushered her to victory. She was followed at the time by Kora Grzyb and Mellisa Spillman. This year she is moving in the Pro division were other girls like Allysa Bergado, Amelia Brodka and Lizzie Armanto will fight to be on the highest step of the podium. The 2nd Annual Girls Combi Pool Classic is coming November 5th and she will be ready for that. isTia.Tv: Age or DOB? Jordan Abraham: 14 years old. isTia.Tv: How were you introduced to skateboarding and what got you started? Jordan Abraham: I was introduced into skating from my brother who is one year older than me. I used to watch him shred the skateboard as a youngin’ and iw as like, whaaaat I wanna do that! I was about 5 or 6. 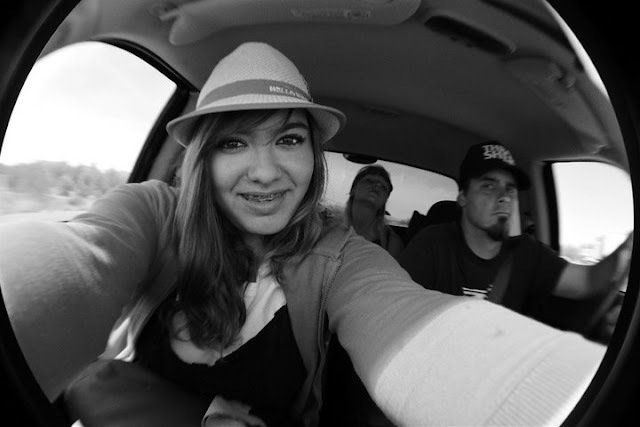 Jordan Abraham, Matt Gaudio, and Sarah on their way to visit AZ. They got to hangout with Patt McGee there. isTia.Tv: Years skating: Jordan Abraham: I’ve been skating for around 4 or 5 years in all. Competitively for about a year and a half. isTia.Tv: Were there any early influences on your skating? Jordan Abraham: My brother. He’s the main reason why I started skating. 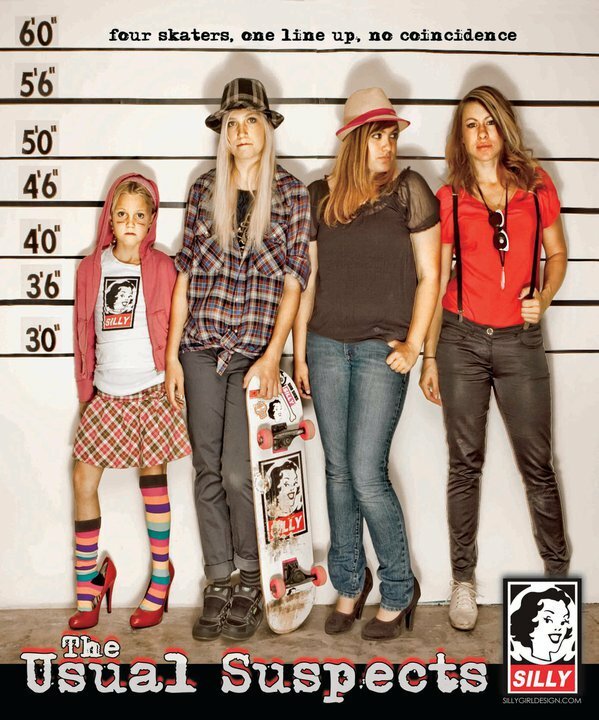 isTia.Tv: How are your parents involved with skateboarding? Jordan Abraham: My parents are really supportave. My mom always comes and watches my contest, and she takes a lot of pictures too. My grandparents are big supporters too. They help me financially when I travel to contests. isTia.Tv: Do you have Sponsors: Jordan Abraham: Yes I have two. Silly Girl Design (sillygirldesign.com) and EFX balance bracelets. Silly Girl supplies me with boards, clothing, and contest entry fees. They support me soo much, I couldn’t ask for anything better. I met Matt and Jamie- the owners of Silly Girl about 2 years ago or so at Vans. I first started out on the street team of silly girl. It took me about a year to finally get on the team as a posse member. I became an official team rider early 2011.
isTia.Tv: Do you feel that if you were a boy, you would have more sponsors? Jordan Abraham: Not at all. I’m so fortunate to have the sponsors I have. isTia.Tv: Who are your favorite old school skaters? Jordan Abraham: Steve Cab would have to be my favorite. He’s such a rad guy and he’s always positive. I always make sure to watch him skate when I’m at an event he’s at. isTia.Tv: What’s the most difficult trick you have done? Jordan Abraham: A FS smith. I had always tried one of those and never got it, until one day I locked into one. I haven’t done one ever since. isTia.Tv: What is your favorite surface to skate? Jordan Abraham: Wood for sure. I grew skating Vans which is mostly all wood, so I’ve been hooked on it ever since. 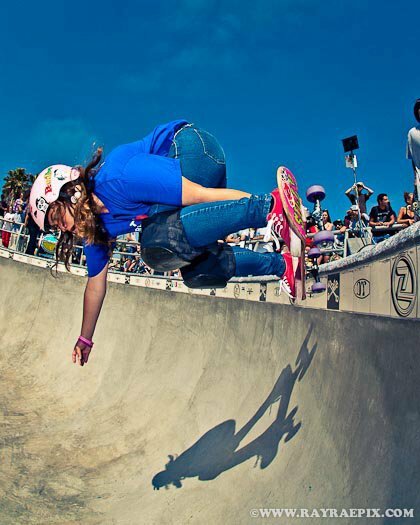 isTia.Tv: Do you wear pads and helmets in a pool/skatepark/bowl? Jordan Abraham: Yes most of the time I just wear my knee pads and helmet. I haven’t learned to bail yet without pads, and I just feel safer wearing my knee pads and helmet. isTia.Tv: Who do you like to skate with? Jordan Abraham: I like to skate with my Silly Girl team which consists of: Mikayla, Sarah, Natalie, Bryce, Julie- Tarryn too. I also like to skate with Aby Zsarnay. She’s always in a good mood, and she’s a really good skater too. isTia.Tv: How long do you spend skating every day? Jordan Abraham: I spend about an hour each day on the weekdays because I have skateboarding for P.E. isTia.Tv: Is there a difference about how skaters treat girls in skatepark? Jordan Abraham: Yes. People probably think like “Oh she can’t skate!” So it’s cool to show them you actually can. isTia.Tv: Do you have to be a tomboy to be a girl skater? Jordan Abraham: No way! isTia.Tv: How do you feel that there was no bowl or women vert at the Dew tour this year? Jordan Abraham: That’s pretty lame! It’s cool to watch the guys, but they are always around. I think having a women’s division makes the competitions different and more awesome. isTia.Tv: What was your worst injury? Jordan Abraham: I haven’t really had any major injuries. I got knocked for a few seconds in the combi last year. Sprained my ankle. That’s really all. Hit my head in the combi 2010: INight before the combi classic, and I ended up winning the next dat. It was pretty rad. Then, I sprained my ankle at a silly girl event: 2 weeks after that I got my splint off, and I skated in the Tim Brauch memorial that weekend. isTia.Tv: What is your main source of inspiration that keeps you going in skateboarding? Jordan Abraham: Hmm, well It’s so tempting to try new tricks, and when you land them it’s the best feeling ever. I also like to hang with my friends at skate parks and try new things with them. isTia.Tv: Are contests important for you? Jordan Abraham: Yes, I represent my sponsors there. isTia.Tv: How many contests have been in? Jordan Abraham: I’ve been in at least 15 contest throughout the past year. isTia.Tv: Do you often go to contest? Jordan Abraham: Not really. I skate contest about every 3-4 months or so. isTia.Tv: Do you like contests? Jordan Abraham: Yeah, there are really fun. I like seeing all my friends from out of state and it just makes skating that much more awesome. isTia.Tv: Is it important to go to contests? Jordan Abraham: For me, yes. I rep. My sponsors there, and they gets me noticed I guess. isTia.Tv: Your best contests ever? Jordan Abraham: Florida Bowlriders- Kona. It was so rad going to FL for the first time. Postive energy all around. It was such a great time. isTia.Tv: Your worst contests ever? Jordan Abraham: The Unifecta in Oregon 2011. It was unorganized, the bowl sucked, I didn't skate too good, it was just a mess! isTia.Tv: Worst contest memory? Jordan Abraham: I was skating Vans the night before the Combi Classic, and I hung up in the deep end and knocked outon the floor...it sucked!!! Jordan Abraham: For boys: Coastal Carnage, Dew Tour, X Games, Pro Tec. And for girls: Tim Brauch Memorial, Girls Combi Classic, X Games Womens Street. 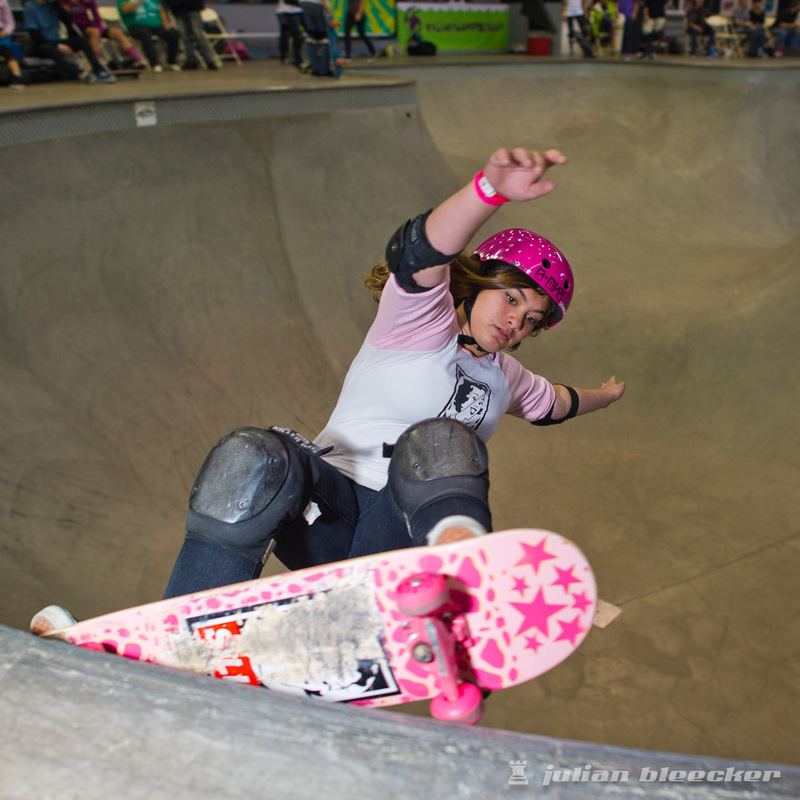 isTia.Tv: How did you qualify for the 2nd Annual Girls Combi Pool Classic? Jordan Abraham: Yes I am going again this year. I got invited to the Pro division this year from winning the AM division last year. isTia.Tv: How do you train for the Combi Pool contest? Jordan Abraham: I train by skating vans as much as I can, skating hard, and finding really good lines. isTia.Tv: How often do you go to Vans? Jordan Abraham: I go to vans at least 3 times a month on a regular basis. isTia.Tv: Who do you see in the Podium at the Combi Pool this year? Jordan Abraham: Ams: Arriana Carmona, Miayla Sheppard, Annika Vrklan. Pros: Allysha Bergado, Lizzie Armanto, Abby Zsarnay and Julie Kindstrand. isTia.Tv: Have you ever skated a bigger bowl than Vans? Jordan Abraham: Well I skated a bowl in San Jose that was 13, and vans is about 12 so yep I have. for concrete wave. We got to dress up in different outfits, it was so much fun." isTia.Tv: Do you prefer the old Vans or the new bowl? Jordan Abraham: I never really got to skate the old vans much. The resurfaced combi is amazing! So smooth, I love it! isTia.Tv: How much do you ride vert & bowls (compared to street)? Jordan Abraham: I don't ride street at all. Bowls are what I skate the most just because that's what I love, and vert ramps I don't really get to skate much. isTia.Tv: What is the most important bowl contest of the year? Jordan Abraham: I would say the Combi Classic. isTia.Tv: Should there be more girls (bowl-vert) contests? Jordan Abraham: Totally! There's only about 5 major contest...they really need a bunch more! Pictures by MRZ, Ray Rae, Julian Bleecker, Chris Zsarnay. To see more pictures of Jordan, go to www.rayraepix.com or www.helloskatergirl.com . You can also log to Silly Girl Design, they have an awesome collection of boards, accessories, gear and equipment for girls.